Is that blood in the sink? Are your gums bleeding? It’s a little thing, so you just decide to move on with your day. Stop! You shouldn’t ignore it. Bleeding gums could mean something more significant is going on in your mouth and with your oral health. Learn all about the causes of your bleeding gums with your Chevy Chase dentist. Side effect of medications like blood thinners. Having dentures or other dental appliances that don’t fit well. Symptom of a serious medical disease, such as leukemia or thrombocytopenia. Although the other causes are possible, the most likely culprit is gum disease. Gum disease occurs when plaque, the white film that houses harmful bacteria, irritates and attacks the bond between gums and teeth. These bacteria produce toxins that usually cause the gums to become inflamed. When aggravated by brushing, the gums can bleed. If caught and treated in the early stage of gum disease, called gingivitis, the gums should return to their normal, healthy condition. If plaque is allowed to calcify, it becomes tartar, which is much harder to remove. Like plaque, tartar adheres to teeth, particularly around the gumline, and causes further irritation. In more advanced stages of gum disease, or periodontitis, gums separate from the teeth, opening pockets for food particles and plaque to collect and cause more extensive damage to teeth’s supporting fibers and bone. If left untreated, gum disease can lead to permanent damage to gums and supporting bone and ultimately to tooth loss. What can the dentist do to treat gum disease? The good news is that your Chevy Chase dentist can treat gum disease at any stage. For gingivitis, usually regular cleanings and good oral health practices are enough to reverse the condition. 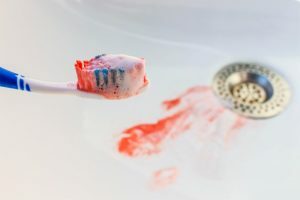 If you have a more advanced case of gum disease, your dentist may need to perform a deep cleaning of your teeth below the gumline—called scaling—and smooth the rough spots on your roots’ surfaces—called planing—to prevent plaque from adhering again. Even if you exercise healthy oral habits, you still need to visit the dentist regularly. Your hygienist or dentist uses professional tools that are equipped to remove tartar and plaque that you might have missed. The dentist also conducts an oral exam to check for any signs of conditions, including gum disease or oral cancer. It’s better to catch a problem when it’s small than to treat it later when it could cause serious damage. During your appointment, make sure you raise any concerns you may have about your oral health. What can I do to prevent bleeding gums and gum disease? If you just started flossing and your gums bleed, don’t worry—that’s normal. The more you floss over time, the less they should bleed. Bleeding gums is more than just a little annoyance to overlook. If you see blood when you brush, take action to treat your gum disease. By taking care of your teeth and gums now, you can enjoy your healthy smile for years to come. Schedule an appointment with your Chevy Chase dentist today! From comprehensive checkups and cleanings to advanced full mouth reconstruction to aesthetically friendly orthodontic solutions like Invisalign and Six Month Smiles, Dr. Ronan Freyne offers a wide array of services to patients in the Chevy Chase area. To contact him, you can call (301) 986-0700 or click here.